the colour of piccalilli is so enticing. I have a jar of my friends on the shelf just waiting to be savoured over Christmas. She said she liked the fact that you're not boiling it for hours so the vinegar smell doesn't invade the house like chutney can. It was lovely and all the more so knowing the veggies were home grown. Yours looks delicious too. Its something I grew up eating at Christmas with cured ham and we called it 'chow chow'. Because we no longer eat meat/ cheese (it adds a real kick to a cheese sandwhich, especially if there is hot pepper in the recipe), its not something we eat much of anymore. Really tempted to make some though, if for no other reason but to add my nasturium seeds, I'm sure I could find some fresh ones tomorrow. Such a gorgeous recipe! I'm so impressed with the beautiful golden color and all those luscious veggies! Mmmm, the flavour combo sounds lovely. I like the idea of making your own picacalilli - it looks very professional! yum! this is making my mouth water. Thank you Astra. I too was delighted with the colour and flavour. Next year I am going to add chilli for the extra kick and a nastitium version. I have decided I like piccalilli, esp. home-made ones. I have checked out your various blogs. You will be a busy bee. 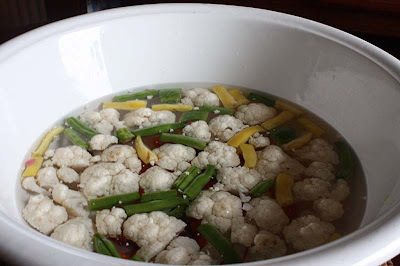 I liked this recipe for its simplicity too, plus it has many of my home-grown veggies, except for the cauliflower (boohoo). 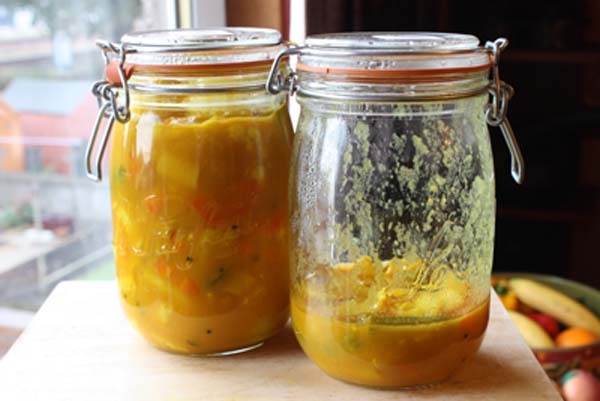 Piccalilli is one of the pickles we always have at Christmas too, yours looks delicious, think I would prefer it chunky.